Today I am joining a link up (my first!) with Dancing with Ashley and talking about my favorite things from the month of June! Every June my parents rent a beach house for a week and my family packs up and relocates for an awesome vacation! It was a great week full of games, food and of course the beach! Everyone pitched in on taking care of the toddlers which was SO appreciated! Especially since my little Lily seems to be a fish. Anytime that anyone was heading down towards the water Lily would trail along behind and catch up– it was so sweet to see my family members just turn around and extend a hand or pick her up knowing exactly what she wanted. One of my favorite memories from the week was crab hunting with the girls on the last night– their reactions were simply priceless but alas, pictures in the dark never really turn out. There is a small splash pad in a shopping center near my moms house. We have spent some fun hours over there and know we will spend many more there this summer. 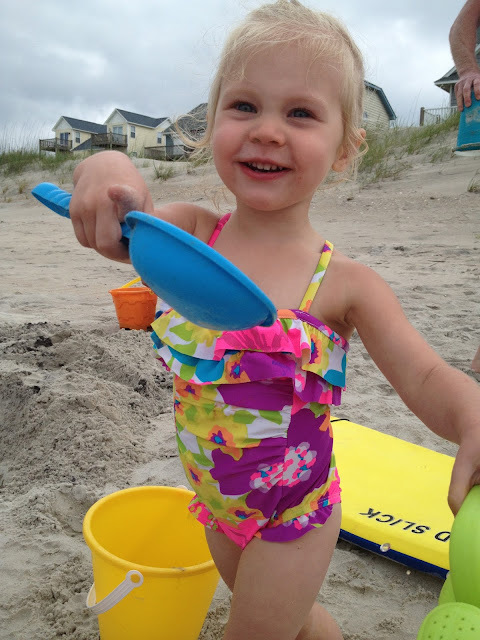 Check out Waverly Place in Cary for the splash pad and tons of events going on there this summer! I know I have talked about the Farmers Market a ton on this blog– but every time I go I love it even more. 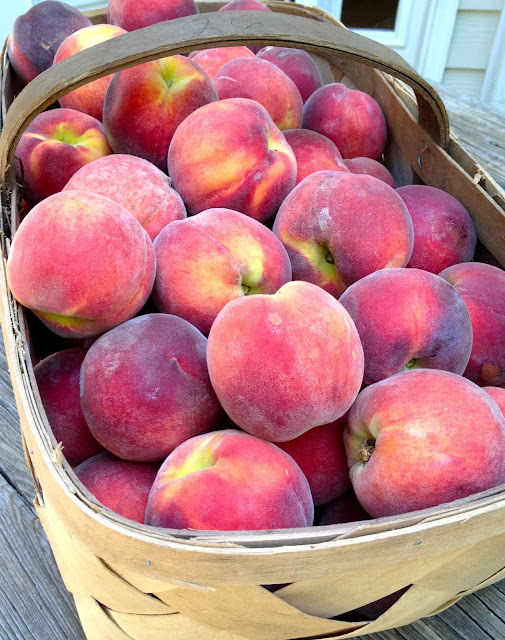 It's peach season over there and they are gorgeous and you can fill your tummy up on all the delicious samples just by doing the rounds. I have enjoyed talking to the vendors the past few times I have gone and gotten recommendations for how to cook vegetables I have never made before. The results have been really good and I have some new recipes to share with you soon! I know the month of July will have even more wonderful things that I can share with you! I LOVE farmer's market season!!! And I am totally jealous of those peaches. yum! i love peaches! My mom buys a 1/2 bushel every week just to slice up and eat! We mooch off of her supply. We might be a bit peach crazy! I have a feeling there are lots of peach recipes coming your way! Visiting from the link up! 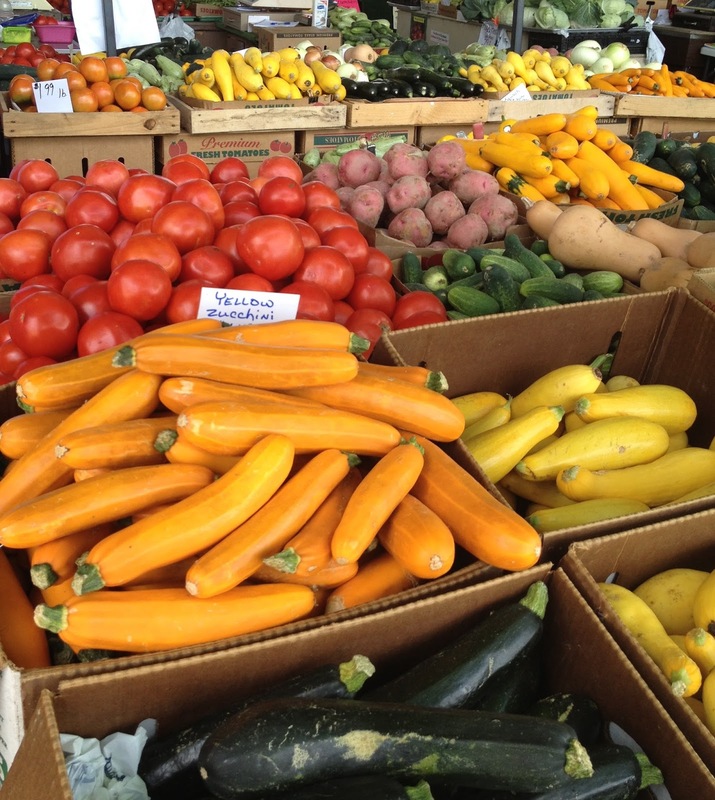 That farmer's market looks absolutely fabulous! I wish I were still in NC so I could check it out. Glad to have you! We are so lucky to have it so close to us! I hope your weekend has been fantastic! The beach trip looks so fun!! I love seeing pictures of the sweet, adorable cousins. Glad you were able to get away for a great vacation. I haven't taken the boys to the splash pad yet. Need to do that soon! And yes to the NC farmer's market. It really is incredible. Looking forward to the new recipes! Thanks, Ashley! I really enjoyed participating in your link-up!